← Why Are Kids So Whiny? I have often heard that when a child is born, everything changes for the parent. When my first child was born, I did not feel this way. Yes, my wife and I got less sleep than we had before but it wasn’t the huge shock to our life I thought it would be. At the time, we were running a specialized foster care home and were already responsible for the well-being of six teenagers. Adding a baby to the mix only slightly increased the organized chaos which was our life. When my second child was born, everything changed. My wife and I had moved on from running the specialized foster care home. We were still with the same organization, but I had moved up to a management position while my wife worked part-time from home and was a full-time stay-at-home parent. Putting it mildly, I worked a lot. Most days started at six or seven in the morning compiling reports from the previous day and sending them to staff. Then I hurried to the office and generally worked what would be considered normal business hours. Often the day or week would go long due to an abundance of evening and weekend work-related events. Most evenings were also spent on my phone answering calls and replying to texts as a major component of my job was crisis support. It wasn’t uncommon for me to leave home in the evening to return to work and help deal with a crisis situation. At least a couple times a month there seemed to be a prolonged crisis which would take all night. I never felt comfortable sleeping while my staff were dealing with a crisis so I would stay awake until the situation was resolved. Sometimes I would get to catch a couple hours of sleep before heading back to work, and sometimes I would just work straight through and crash when I got to one of the two weekends a month I got off. I don’t say all this in order to glorify how much I worked. In fact, I worked the least hours of my department’s three management staff. I merely did what I felt was needed to do my job well. I knew when I accepted the position it would require a lot of hours and a lot of stress. And for the longest time, it was worth it. I worked for a great organization which is one of the best at helping heal children and families. But, then it wasn’t worth it anymore. As much as I wanted to continue on in the career path I was headed, I wanted more to be a father to my kids. I won’t be so dramatic as to say it was an either/or choice. As I’ve mentioned in previous posts, my bosses and co-workers were great. We were always willing to cover for each other and I never felt pressure from my employer to chose between family and career. But, due to my own annoyingly high standards of what defines my personal success, my attention was split between family and career. And when I was honest with myself, I realized career was always going to win out. Within a few months of my second child’s birth, I left my job and became a stay at home parent. To say it’s been worth it is an understatement. I have often heard: your kids will only be young once so cherish the time. I know the saying is a cheesy cliche, but I didn’t fully understand the value of it until I became a stay at home parent. I understand the appeal of big salaries, important jobs and lots of fancy stuff. I understand the respect which comes with being highly successful in your chosen field of work. I definitely understand the competing for most hours worked. What if instead of lots of fancy stuff, you had lots of time to play with your kids? What if instead of respect of co-workers, you had a stronger bond with your children? What if instead of competing to see who worked the most, dads competed to see who spent the most time raising their kids? A year ago I would have been annoyed with myself that it’s been about a month since my last post. There was an arbitrary deadline I had set that has long since passed. But, now? It barely bothers me because in that month I’ve been raising my kids. I’ve been able to invest in them, give them my (mostly) undivided attention and make them feel valued. There’s very little in my life worth more. If you can answer yes, I am happy for you and hope you would be willing to share in the comments so we can all learn from you! If you answer no, I am happy you are not bs’ing yourself! I would encourage you to then give serious thought to what changes you can make in order to get to a place where your situation is more in line with where you’d like it to be. For some, it may be as simple as re-prioritizing your leisure time (i.e. in my last fantasy football draft, I had no idea who any of the players were after the fourth round. My team’s awful but I can have an in-depth conversation regarding the plots of any of the Tinkerbell movies.) For others, it may require more difficult decisions (i.e. the aforementioned lifestyle changes my wife and I had to make). Whatever it may be, we’re here for you! Feel free to comment or send a private message through Twitter or Facebook. I offer no guarantee of being right but I’ll do my best to give you an honest answer. This entry was posted in Articles on Fatherhood and tagged dads, fatherhood, fathers, kids, Parenting, Parenting, SAHD, stay at home dad. Bookmark the permalink. 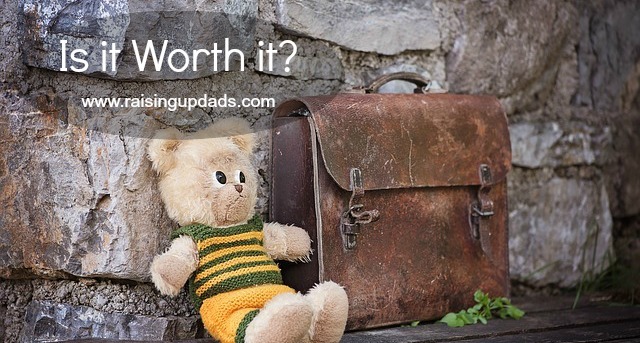 5 Responses to Is it Worth it? Definitely agree about not regretting the time spent with my kids versus working!